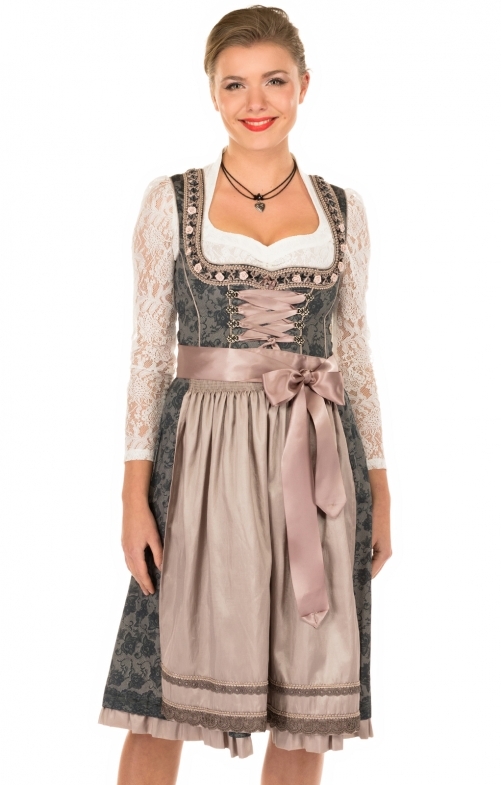 Midi dirndl in new colour combination grey copper. Unusual new colour combination. Fancy design. The new Dirndl by Marjo Traditional convinces in a variety of ways. Two parts. Skirt length 65cm. Perfect for the festive and semi-solid claim. Young enough to be worn by all ages. The design of the outer fabric of this dirndl is expressive. Connected floral motifs harmoniously blend in with the romantic touch of the dirndl. The decorative borders at the neckline are covered with small fabric roses and the copper coloured piping front and back make a slim figure and are nice eye-catcher. The skirt hem is ruffled, which fits very well with this rustic romantic style of this midi dirndl. The subtle colour shades in the individual fabric elements are what make this midi dirndl a very special dirndl. Angezogen - gleich gedacht das sitzt !!! Das Dirndl sieht angezogen wunderschön aus. Der Stoff ist super angenehm zu tragen. Farbe macht nicht blass und es passen super schön graue/ stein Schuhe dazu. Trage aber eine kurze Bluse dazu.